We have been unpacking the fascinating and significant truth that we are a complex system in which we, much like the rhino needs the oxpecker, have a symbiotic relationship with the microorganisms (microbiota) that live in us and on us. That of the twenty million microbial genes that make us more unique then our human genes do, the skin and gut microbiomes are dynamic and interrelated entities that can be influenced and manipulated to change our holistic wellness. Today we will continue that discussion by looking at more ways to affect the skin and gut microbiomes, including Prebiotics and Probiotics, a natural skin remedy, and a series of yoga poses to enhance gut mobility. I heard the Probiotics and Prebiotics work, is this true? As with everything, there is a delicate balance. 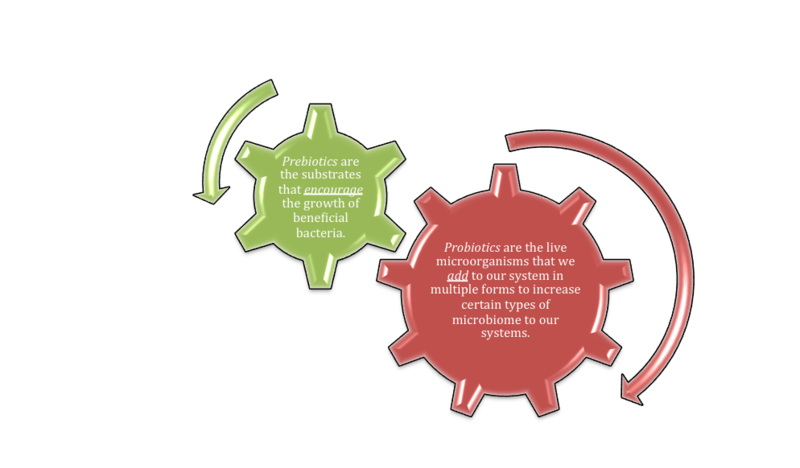 Probiotics and prebiotics have their place, however without understanding their purpose, their use or overuse is frivolous. In relation to the explanatory diagram, and if we begin to think holistically as per the Ayurvedic philosophy, in order to facilitate optimal health by maintaining our skin and gut microbiome balance the focus is on functional foods, or the prebiotics. This will encourage the growth of the naturally occurring balance of microbiome within our systems . Unless of course, we find ourselves in a state of imbalance (perhaps due to the use of antibiotics) – in which case naturally derived probiotics are in order (for example milk and fermented milk product). By understanding the dynamic energies within you, more specifically the function of your skin and gut microbiome, by taking into consideration the lifestyle and diet ideals mentioned here , holistic wellness is attainable. For more diet specific advice, or for a lifestyle plan consider meeting with Celia Roberts to discuss your unique constitution, as well as a more specific wellness regime to balance the energy within. So, are there any natural remedies you would recommend for my skin microbiome? The best and most efficient remedies always begin with addressing your constitutional type. That is, what sort of skin do you have and how does this relate to your dosha? Knowing your type will better address the remedy you will want use. In saying this however, a most essential step in skin care is to first ditch the soap. There is no point stripping away the microbiome before attempting to restore balance! Further to this try utilising a home made Kefir based face mask. Though there is no certain evidence as to its efficacy (though with skin care is there ever? ), the underlying principals work by delivering PH balancing alpha hydroxyl acid (AHA) to your skin. AHA is the good stuff in most commercial face creams that helps to remove dead skins cells, smooth fine lines, and sooth inflammation. I am wondering what else I can do to affect my gut microbiome and skin mircrobiome? Yoga is a great way to relieve and prevent digestive symptoms, and thus affect your gut microbiome and skin microbiome. This past weekend at our Digestive Health Retreat we experienced different ways of utalising yoga to better digestion and create change in holistic wellbeing. We encourage connecting with others and gaining an insight to what a future retreat may offer you in your journey towards holistic health.